During Autumn the beautiful parks which Leiden is renowned for turn into a haze of red and yellow leaves, ripening fruits and nuts, cold breath fogging in the air, and squirrels and waterfowl eating for winter. In a slightly unorthodox approach, this article is going to point out several edible plants that you can find (and maybe try) in your explorations of Leiden, as well as some of the best parks in Leiden and surrounding area. 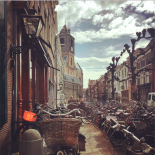 Get your bike, your Instagram, and your palate ready for an Autumn in Leiden! Hazelnuts: These are slightly sweet and creamy in flavour, especially when fresh. The shells are hard so you’ll need a nut cracker (or hard rock). These grow on a slightly shrubby tree which can grow into beautiful and curved shapes, and yields some absolutely delicious nuts. Blackberries: The bramble is ubiquitous in hedgerows, full of thorns but also sweet and juicy berries. These berries can be eaten raw or cooked with apples into a delicious autumn crumble. Sweet chestnuts: These are hard to find, and do need an oven to prepare, however they’re delicious when hot and roasted. These can also be mixed into a risotto with kale or spinach for a delicious wintery dinner. I wish I could take photos this pretty! Take inspiration! Sloes: The sloe is inedible raw (it’s incredibly tart) but washed and put in a bottle of gin or vodka with sugar and left to steep for a couple of months, you’ll get a wonderful and unique liquor. This can make a wonderful gift or an excellent wintery drink. Hazelnuts, sweet chestnuts and blackberries can all also be purchased in the supermarket or at the Saturday market if you don’t feel confident gathering, however I would still recommend visiting some of Leiden’s parks to try spot them at least! The fresh air is really wonderful for clearing your mind and making you feel in touch with the city. Some of the best parks in Leiden to visit during Autumn include Van de Werfpark and Plantsoen park. If you’re willing to travel a little further, both Polderpark Cronesteyn and Koudenhoorn are beautiful settings for an autumn walk, with a wonderful variety of wildlife. This entry was posted on October 11, 2018 by Sophie Jorgensen-Rideout in Leisure, Living in Holland, Nature, Sophie and tagged autumn, explore, food, fun, Instagram, outdoors, walking.